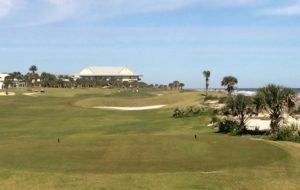 We traveled to Hammock Beach Resort for this year’s Golf Writers Association of America tournament, which took place immediately after the PGA Merchandise Show in Orlando, FL. Both the location and the timing were a significant shift from past GWAA tournaments. I began playing in them when they were held in Pinehurst, NC the week before the Masters. Last year we played at Reynolds Lake Oconee the week after Patrick Reed conquered Augusta National. Hammock Beach Resort sits next to the Atlantic Ocean in Palm Coast, Florida, about a half-hour’s drive south of St. Augustine. I left Orlando and drove to Ormond Beach just above Daytona, so I could use the historic Route A1A for the rest of the trip. I wanted to see how the beaches and roads had recovered from Hurricane Matthew, which caused so much damage to this part of Florida in the fall of 2016. A1A was fully repaired, but most beaches still show the effects of the devastation. For many miles there was a significant dropoff very close to the road, similar to what Cape Region beachgoers see in Rehoboth, Dewey, or Bethany Beach after three-day nor’easters. Hammock Beach faced several challenges during the event and thereafter, especially on the Jack Nicklaus-designed Ocean Course. With six holes directly on the oceanfront, and with others nestled among wetlands, the tree damage, flooding, and salt water intrusion must have been daunting. Several buildings were also hard hit. Brad Hauer, a PGA pro and the Resort’s general manager, explained that Bermuda grass can tolerate salt at 1,500 parts per million (ppm). Testing after Matthew showed infiltration in the 30,000 ppm range. The resort owners spent over 4 million dollars to repair the golf course damage. The work included two applications of finely crushed gypsum to help neutralize the salt’s effects. The ninth hole on the Ocean Course, Hammock Beach Resort. During the renovation they also decided to maintain all of the Ocean Course’s turf at fairway height. Originally the idea was to keep it short during grow-in to help prevent weed infestation. 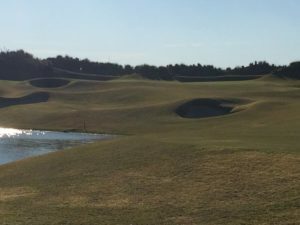 Hauer said they came to really like the look and performance of the paspalum in that configuration, discussed it with the course architect, and kept to it after the course re-opened. Hauer also said that they cannot over-seed for winter with rye, as is commonly done on Florida golf courses. During January and February, however, the paspalum can create very tight lies. Hauer said in early March the turf begins to grow out and stays in great shape through the next fall, and is hugely popular with the members and the guests playing at the Resort. The Conservatory is the second Resort course. Designer and PGA Tour legend Tom Watson made seventeen site visits during its construction, adding significant elevation changes on a formerly flat piece of acreage. It is a short drive from the main Resort property, about a mile east of I-95 and west of Route A1A. It features paspalum on its greens, which when we played it ran fairly fast but true. Hurricane Matthew wasn’t nearly as damaging to the Conservatory, requiring primarily tree and debris removal. An uphill par-3 at the Conservatory Course, Hammock Beach Resort, in a low afternoon January sun. The Conservatory is a beautiful layout, with a wide variety of birds enjoying their treats from the ponds dotting the course. I saw a single but impressively large alligator sunning himself, but fortunately my golf ball was a safe distance from him. 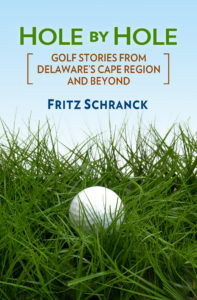 Our round the next day on the Ocean Course presented challenges above and beyond the Nicklaus course design. Temperatures began in the high forties and never went past 57, and the 15 to 20 knot winds from the north added a real chill factor. I also didn’t fully appreciate before the round that all of the Ocean Course turf is kept at fairway height. With the tight lies and high winds, my golf ball could and did roll along until it stopped amidst a stand of trees or gently into a pond. My round’s “incidents” were matched if not exceeded by most other players that day, judging from post-round conversations. That said, with a bit more course familiarity, a bit more warmth, and far less wind it would have been a lot more fun – and with about 80,000 rounds per year combined on the two courses, that must be so. Apparently the Big Ten Conference agrees. The Division One athletic conference holds a match play championship using both courses in February. The resort amenities were impressive. We shared three-bedroom suites that were nicely appointed and with great views. The staff were professional and helpful. The Loggerheads Bar on site also had a nice selection of local microbrews.